Buy a bag of gummy body pars for your Halloween candy hand out candy and be the hit of the neighborhood. I am not sure why, but if the candy is gross the kids will love it. 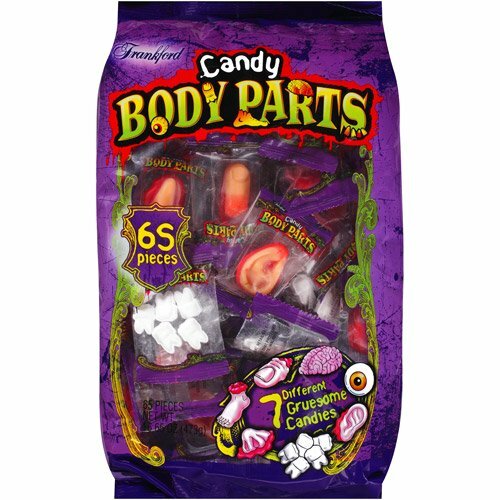 Candy body parts come in an assorted bag. You get gummy eyes, feet, ears heck you even get gummy brains. All of these gummies are fruit flavors and are perfect for handing out as the are individually wrapped. It's always hard , at least for me when trying to choose a candy that I want to hand out to my trick and treaters. Of course you want to have something they are going to like, yet I always try to have something age appropriate. When it comes to giving out gummy candy for Halloween you can't go wrong. Most all kids no matter what age love gummies. Seeing they are a chewy candy they are also something that the smaller children can eat without the worry of choking. If you are trying to find a candy that is great for kids of all ages gummy candy is a choice you really can't go wrong with. Buy a bag of gummy body parts and watch how much fun the kids have with them. Candy Cigarettes - Should They Be Banned ?